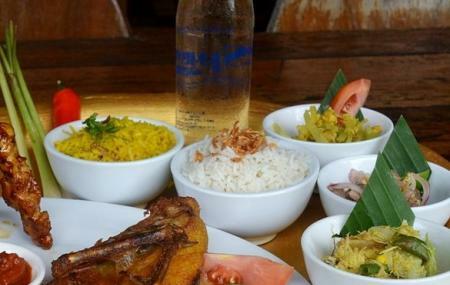 Find hotel near Warung Mufu Balinese Food .. If you are in Tuban, Bali and want to relish authentic Balinese food, then head to the Warung Mufu Balinese Foods & Pork Ribs with your family and friends. The restaurant offers both veg and non-veg meals which are simply mouth-watering. You can choose from an array of pork ribs and selected Balinese favourites from their menu, which are all affordable and delicious. Whether you plan to visit here for lunch or dinner, the waiters and chef will cater to all your needs and requirements. You can also sip on some fanciful beverages, while you enjoy a special and complete authentic cuisine in Warung Mufu. How popular is Warung Mufu Balinese Foods & Pork Ribs? Amazing is an understatement the food was incredibly, best food we have had in Bali the pork ribs were to die for and the staff are very friendly and attentive and explain all about the little dishes we had would highly recommend visiting. Absolutely delicious!!! Lovely place and the staff are really friendly - one of the best meals I’ve had on bali!! This place is absolutely delicious! Perfect for your “last meal” before leaving Bali. If you’re traveling with a backpack, get dropped off here by your taxi and then walk the last ten minutes to the airport - well, we’ll wroth it!